Assisted Living (AL) communities all over the country are celebrating Assisted Living Week from September 8th – 14th with the theme “Homemade Happiness.” Seniors now find supportive services they need in ALs, when once their only choice was to live in a nursing home. The AL environment provides socialization and supportive care to those who choose to or can no longer live in their homes. 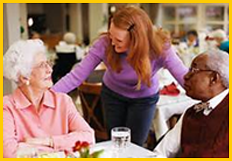 Several South Florida AL communities are part of our team, providing quality care for MonarchCare clients. And many individuals who contact MonarchCare don’t need our services, but do need AL suggestions. We educate them about what to look for when choosing a community, provide them with a checklist of services and amenities that are important to note during their tour, and make referrals to ALs we believe would be a good choice for the proposed resident. Please think of MonarchCare when someone you know needs help but doesn’t know where to turn. Maybe they need help with budgeting or paying their bills due to vision or cognitive issues. Perhaps the family lives out of town and, because it is hard to manage the oversight of the care of their loved one, they need someone to check on them periodically. Or maybe, the individual has no one to help them as they struggle with age or a disability. We will tailor a plan of care to the needs of the individual, and as a non-profit agency we charge on a sliding scale for those with limited resources. In July and August we provided 586 hours of pro bono services thanks to you! 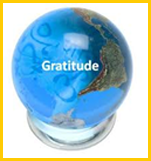 World Gratitude Day was launched in 1965 at the International East-West Center in Hawaii during a Thanksgiving Dinner hosted by meditation guru Sri Chinmoy. Those in attendance, including delegates and high-ranking officials from more than a dozen countries around the world, pledged to celebrate gratitude and to count blessings from their home country every September 21st. If you are lucky enough to have good health, then celebrate it on World Gratitude Day on the 21st. Good health is dependent on many things, but imagine if a primary barrier to your health was not having access to clean drinking water! Many of our clients are not in the best of health, but we advocate for them to make sure they get everything they need to maximize the health they have – from clean water to medical attention and social stimulation. 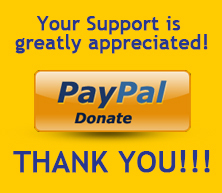 We are grateful for your support so we can help more people stay healthy – Thank You! Two major components of good health are physical exercise and peace of mind. Yoga isn’t just a physical exercise program; it is a scientific system designed to generate greater clarity and harmony in life. With regular practice, individuals often develop a stronger, slimmer and more flexible body, in addition to a mentally sharper, more patient and relaxed sense of self. By practicing yoga you have the opportunity to improve your health with a positive, non-forceful approach. Give it a try today! Visit the Yoga Health Foundation's website for more information. BUY YOUR TICKETS BY SEPTEMBER 19TH AT $40 AND SAVE $10. Our delicious food will be provided by Exquisite Catering by Robert and great music by LeMar Productions. Sponsorship opportunities are still available, including the Presenting and Beverage Sponsorships. Do not miss out! Buy your ticket today and keep voting for your favorite Connector! 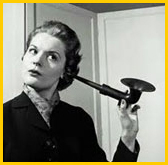 Please also take note of our new website and e-mail changes. The website is now www.MonarchCare.org. All email signatures continue to be first initial+lastname, but are now @MonarchCare.org. Please update us in your database and mark us as “safe senders” for our emails. Do you shop online? 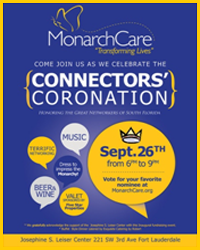 Become a member of “iGive.com – Change Shopping for Good ™” designating MonarchCare as your favorite cause and a portion of your purchase from over 900 stores will be donated to us to help serve our vulnerable clients. Click here to become an iGive.com member.